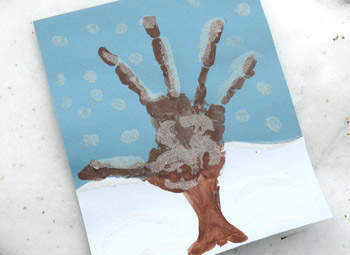 This fun snow scene is made using your child’s handprint, which also makes it a great keepsake craft. Regular table sugar adds a glittery touch to this winter art. Lay white paper sideways (landscape) and cut the paper in half using a curvy cut. Place paper across the light blue construction paper. Use the glue stick to attach it to the bottom third of the blue paper. Trim off any excess white paper. Paint child’s palm and fingers with brown paint. Have child spread out his/her fingers then press his/her palm and fingers down onto the paper. Use finger to paint on a “tree trunk” under the palm print.Wash off child’s hand. Use the glue stick to apply glue to the fingers (branches) and snow (white paper).Use glue stick to draw dots or small circles onto the blue. Sprinkle all glued areas with granulated sugar. Carefully lift paper and tap off excess sugar over the sink or a piece of wax paper. Construction paper is perfect for impromptu craft projects. Poster paint will work in place of acrylic craft paint. Be sure to wash child’s hand with soap and water before continuing with the project so that the paint will come off easily.